Please join us Saturday, September 20 for Saturday sketch sessions by Allison Davis (top layout) and Debbie Sanders (bottom layout). • To make both layouts, order a duplicate set of paper when you register. • The fee for a kit is $6. Shipping is an additional $6.99. • To occasionally make both layouts, order a duplicate set of paper from SG's online store. 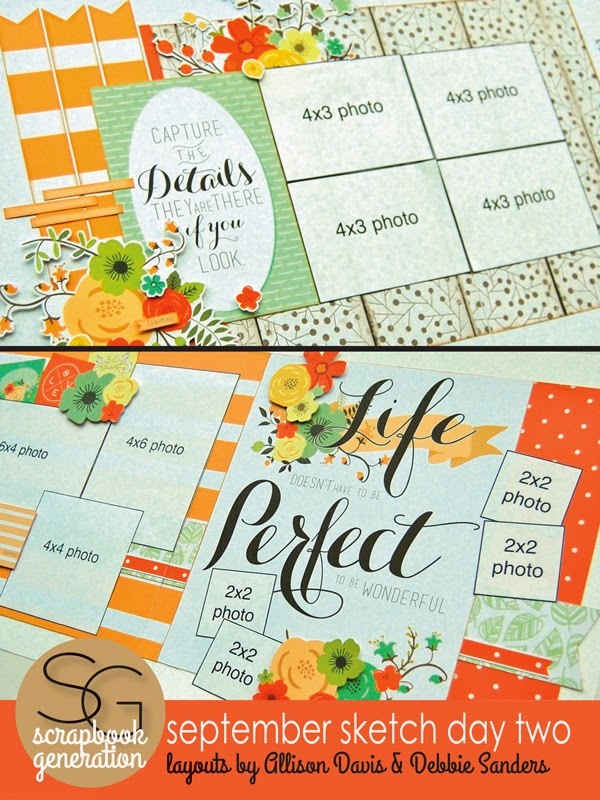 Ordering kits and add-on embellishments or enrolling the Super Sketch Club and/or Super Sketch Club Double Up is done at scrapbookgeneration.com. Scrapbook Generation hosts Saturday crops on the first, second, and third Saturdays of the month. The crops are the same days as the Super-Saver, Sketch Day One, and Sketch Day Two sessions, so you can attend both crop and class if you want. We have room for both activities at the same time! * The classroom in the SG store. We have room for 16 people.